2. Rub little turmeric , chili powder on the eggs.Cut the eggs into halves. Fry both sides carefully in oil. Fry the potatoes. 3. In a pan heat oil, add the bayleaf, cinnamon and cardamom. Fry for a while. Add the onion paste. Add Chili powder, turmeric powder and salt. Cook well adding water little by little. Now add the poppy seed paste.Cook for a minute. Add little water and put the eggs and potatoes. Cover the lid .Add some green chilies just few minutes back you turn off your stove. 1. To peel the eggs easily add little salt in the water while boiling the eggs. 2. You may add yellow mustard in this recipe too. For this just add 1 tea spoon of mustard with the poppy seed. Grind them into a smooth powder and add water to make a paste. 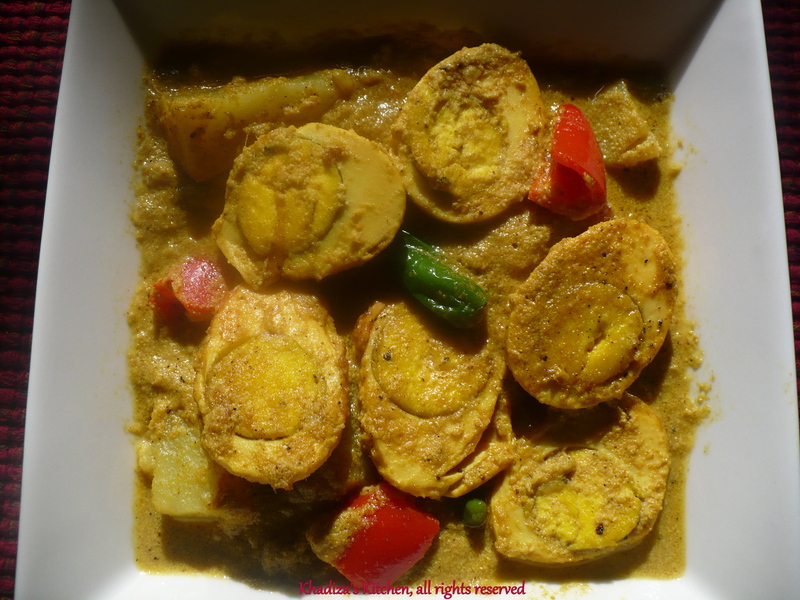 This entry was posted in Eggs, Glossary / Notes and tagged Bangladeshi recipe, Deem-posto, Dim-aloo-posto, Dim-alu-posto, Dim-posto, Egg, Egg Curry recipe, Egg recipe, Indian recipe. Bookmark the permalink. Egg and Aloo, I like both. This is one of my favorite recipe. Thanks to khadiza Haque apu to share this wonderful recipe to us.